I love coming up with fun ways to improve children’s auditory memory and listening skills, especially activities that move beyond pure rote memorization of numbers and letters. Although you’ll find that I sometimes design those very basic auditory memory skill builders, too, Building Auditory Memory with Grid Art: Geometric Animals is neither basic, bland or boring. It offers kids a much more interactive experience AND offers parents and teachers a more covert way of strengthening auditory memory, so critical for learning with ease and confidence. I’m guessing you’re the kind who appreciates those sneaky skill-builders, too. If you and the kids enjoyed my earlier sample of Graph Art for Auditory Memory I think you’re going to love Building Auditory Memory with Grid Art: Geometric Animals. It’s similar, but with a slightly more advanced twist. Instead of coloring squares on a graph, students get to play a more sophisticated form of dot to dot. They find coordinates, remember coordinates, and remember which ones must connect to each other. In the end, they create a geometric-style animal they can feel quite proud of. Important tip: For both graph art and grid art activities, students should already have a basic understanding of rows, columns, and graph coordinates. The included Instructor Script offers a brief practice period. However, to really focus on building auditory memory and listening skills, your child should not have to struggle with concepts of graphing during this activity. Coordinates for Grid Art Activity #5 You read the coordinates out loud. Students connect the coordinate points with lines that eventually create a friendly fox. Using a straight edge is optional, but recommended. Kids can color their creation when finished. 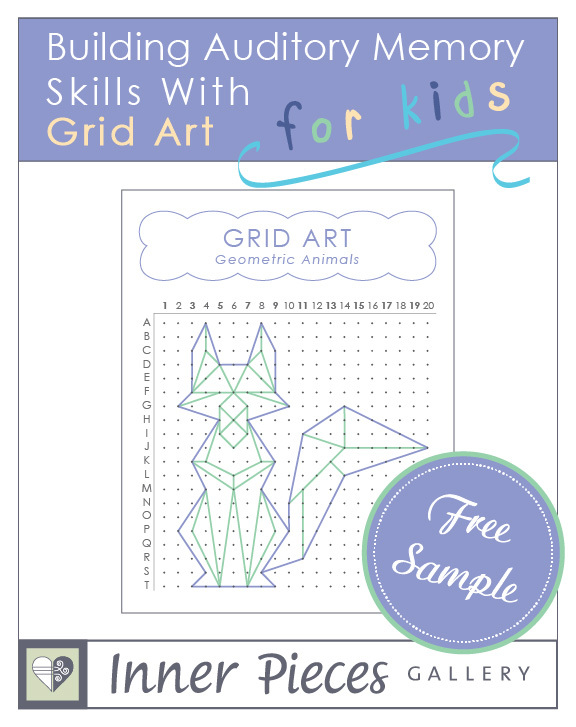 The geometric style of the finished animal makes this a great activity for math or art class as well! Answer Key Hint: hide the answer key until kids check their work at the end. I do recommend single page printing on this one. Ready to sneak in some more auditory skill building? Subscribers, sign in. Not subscribed? No problem. Step 1) Sign up below. Step 2) Complete the registration process using the same email you used in step 1. Step 3) Enjoy the entire Free Printables Collection that awaits you! Ready to boost children's learning abilities? Newsletter subscribers receive tips, tricks, the occasional special offer, PLUS gain access to THE FREE PRINTABLES COLLECTION.